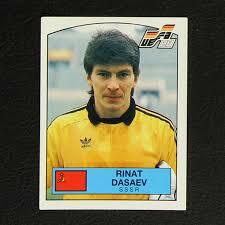 Rinat Dasaev must be the reason i started playing as a goalkeeper when i was young even if i hadnt seen many of his games. Nevertheless, his status during the 1990 world cup was legendary and even if his perfomances were not matching his reputation, he was still the best goalkeeper of the world at that time. The Soviet, Russian, and more specifically, Tajik-born goalkeeper Rinat Fayzrakhmanovich Dasayev, was born on 13 June 1957 in Astrakhan, South Russia, in the Volga Delta in the Caspian Sea. Tall (1.89m), flexible, with great perception, amazing reflex and leadership skills, is considered the 2nd Best Russian Goalkeeper, worthy successor to All-Time Top Goalkeeper and compatriot Lev Yashin. One of the Best in the World in the 1980s, he was awarded the Best Goalkeeper of the Year award in 1988 by the International Federation of History and Football Statistics (IFFHS). The same player, in 1999, was elected the 16th Largest European Goalkeeper of the 20th Century, with Italian Gianpiero Combi and 19th in the World. In 2004, he was named by Pele (Edson Arantes do Nascimento, ” Pelé ”) as one of the 125 Greatest In Playful Players of the World, as part of FIFA’s 100th Anniversary celebrations. 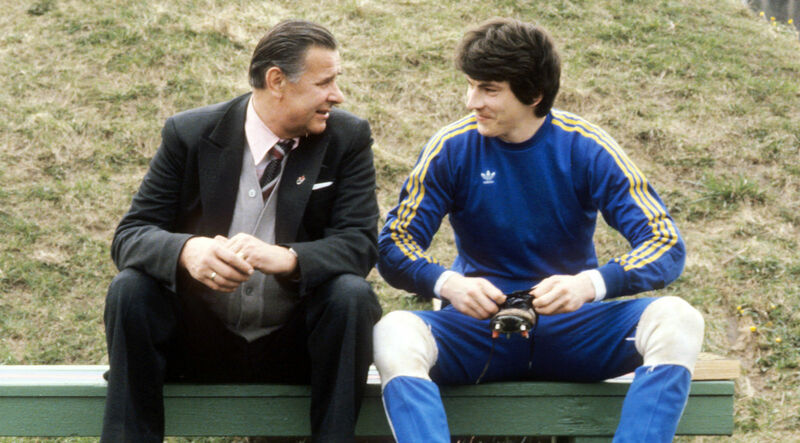 With the nicknames “The Iron Curtain” and “The Cat”, he was Spartak Moscow’s goalkeeper during most of the 1980s, conquering the Soviet League twice, in 1979 and 1987, and named 6 times as the Best Soviet Goalkeeper, while in 1982 he was named Soviet Footballer of the Year. He retired in the early 1990s, after his contract with Spanish Seville expired. He played for the Soviet national team at the 1980 Olympic Games and appeared in the 1982, 1986 and 1990 World Cups, reaching the 1988 European Championship final, making 91 international appearances from 1979 to 1990, the second rebound of entries for the Soviet Union. As a child he was engaged in swimming, taking part in Soviet competitions for children, but after a surgery in his hand, he abandoned swimming and at the age of 9 he was enrolled in the departments of the organization of his hometown, Volgar of Astrakhan. He started professional with this club, debuting on August 5, 1975, to a 0-2 defeat, away from Terek of Grozny. The following year, she took part in 26 of her 40 games taking a key position, displacing Youri Makov. He played for Volgar for the last time on Sept. 11, 1977, when Spartak Moscow’s talents were discovered, which had just been demoted to the Second Division of the Soviet League, convincing him to join his roster. He took the opportunity from the hair and although he underwent a meniscus surgery on both knees (!!! ), at the age of 20 he was already irreplaceable under the beams of “redcurrants”! Under the technical guidance of Konstantin Beskov, at that time Spartak was strongly competing with Dinamo Kiev’s Valeriy Lobanovskyi. He stayed in the Spartak roster until 1988 and during that time he took part in 335 matches, celebrated a B class championship in 1977 and two other A ‘category championships in 1979 and 1987, while also debuting in the representative group of the USSR in 1979. In 1988, taking advantage of the policies of glasnos and perestroika promoted by the last Soviet Union leader, Michael Gorbachev, managed to leave the USSR and get a transcript for Spain on behalf of Seville thanks to one of the four Licenses (a kind of laissez-passer) granted by the Soviet Ministry of Sports, leaving his wife and daughter in the Soviet Union. Sevilla has disbursed $ 2 million to make her own, a record amount for goalkeepers and for the record of the season. Although he was one of the best in the world, federal coach Valeriy Lobanovskyi was an aversion to all those who left the USSR to fight abroad, showing preference to the players they stayed behind and especially those of Dinamo Kiev. Footballers such as Oleksandr Zavarov, Sergei Aleinikov and Vagiz Khidiyatullin faced problems, and Dasaev excluded him from the continuation of the 1990 World Cup after the first match, defeat from Romania with 0-2, on June 9, 1990, which resulted in the final rupture in the tensions of the two men, anyway. He arrived in Seville on November 21, 1988 and on November 30, made his debut in the Spanish championship against Real Madrid in a 1-1 draw by making one of his best games in Spain. A few weeks later, his wife and daughter arrived in Seville but allowed almost immediately back because his salary is not enough to keep all three in the Iberian country. In October 1989, he became the leading star with a poor performance in a match against Real Madrid in a game that Sevilla defeated in Sept. 2-5. The “devotees”, at that time, struggled to remain in Primary Division. At the same time, other events there were a negative sign of his life, both in the sports sector and in the family. This has greatly influenced him by accepting enough goals, losing the base position and falling short of depression. The phenomenon of alcoholism occurred because of his abandonment by his wife and daughter, which influenced the great player, who began to lose confidence in himself. Soon he became the fourth foreigner, while during this period, he had a first car accident caused by alcohol abuse, breaking his hand. His club proposed to go to Switzerland for recovery, but he refused it. Deposed and unable to withstand ridicule, he withdrew from football shortly afterward in March 1991 and at the end of the season, less than 34 years old, retired from active action. He had been able to take part in 59 matches of the Spanish club. He was 91 times international with the USSR, with these entries placing him second in the Soviet players with most international appearances, after Oleh Blokhin! His first match for the national squad of the USSR was held on September 5, 1979, against East Germany (1-0). He captured the Bronze Medal at the 1980 Olympic Games in Moscow and was one of the 1982 World Cup revelations, particularly in the Scottish team match, where the Soviet team was eliminated from the semi-finals in the difference in goals from Poland. On October 10, 1984 he played his first match as the Soviet Union leader, a 1-1 draw with Norway, for the 1986 World Cup qualifiers in Mexico. A member of Lombanovski’s Superman, playing amazingly in the match with France, reached up to 8 where he was eliminated from Belgium. A finalist at the European Championship of 1988, received one of the best goals in World Football History by Marco Van Basten in the final. With the problems of 1990, due to the transcript in Seville, he played his last official game in November 1990 at the first meeting without the emblematic historical hook “CCCP” in the jersey, as the Ministry of Soviet Sport had decided to eliminate it. Of the 91 international races between 1979 and 1990, at 43 was the team leader and scored 68 goals. He became the last goalkeeper to lead the USSR. He also competed with the colors of the Mixed World in 1987 and 1988. He was voted the 1982 USSR Player of the Year and Best Player of the Year for 1988 by the International Federation of History and Football Statistics (IFFHS). The same player, in 1999, was elected the 16th Largest European Goalkeeper of the 20th Century, with Italian Gianniero Kobi and 19th in the World. In 2004, he was named by Pele as one of the 125 Biggest Players of the World in the FIFA 100 Years of FIFA celebrations. He was also named six times as the Best Soviet Goalkeeper by “Ogonyok” Magazine, in 1980, 1982, 1983, 1985, 1987 and 1988. In 2015, he was awarded the Golden Shoe as a Legend of Football. He also returned to Spain and opened a sporting goods store, which went well, but he disappeared abruptly and lost his traces for a few years. The Russian newspaper Pravda, who found him living in a poor state, was looking for him. Since 1994, she has begun to marry Spanish, Maria del Mar, whom she married in 2002, having a son since her first marriage. They won two twin daughters, Beatrice and Alia, born on 09/04/2003, and a son, Salim, born in September 2006. He decided to return to Russia, where friends from Spartak Moscow helped him to return back to football , helping him to detoxify from alcohol, but he can not get rid of the depression that still haunts him. Today, he works as a goalkeeper coach in Spartak Moscow’s infrastructure divisions. In the past he had the same post in Torpedo Moscow, which he served as an assistant coach. He has also been a member of the technical staff of national Russia.